vnc | I Code Raven! My development machine here at Hi Tech being, well, low end, had been driving me crazy. Eclipse used to take eons to build (even by eclipse’s notorious standards), and rviz used to choke and sputter on my point clouds. Highly annoying. My incessant pleas were soon enough heard and I was given access to a mean development rig, resplendent with a SSD and all the fireworks. The caveat being that I could only access it over the network – which meant a simple ssh -X command to access the bountiful resources. Not an issue, right? Wrong. Turns out that ssh -X only routes drawing calls to the client, which means that all the rendering is done locally. So, although I could avail of the (marginally) better build times (remember, it’s eclipse, SSD notwithstanding. Immovable leviathan wins), I was back to square one. As with all things linux, it really couldn’t have been such an obvious solution. 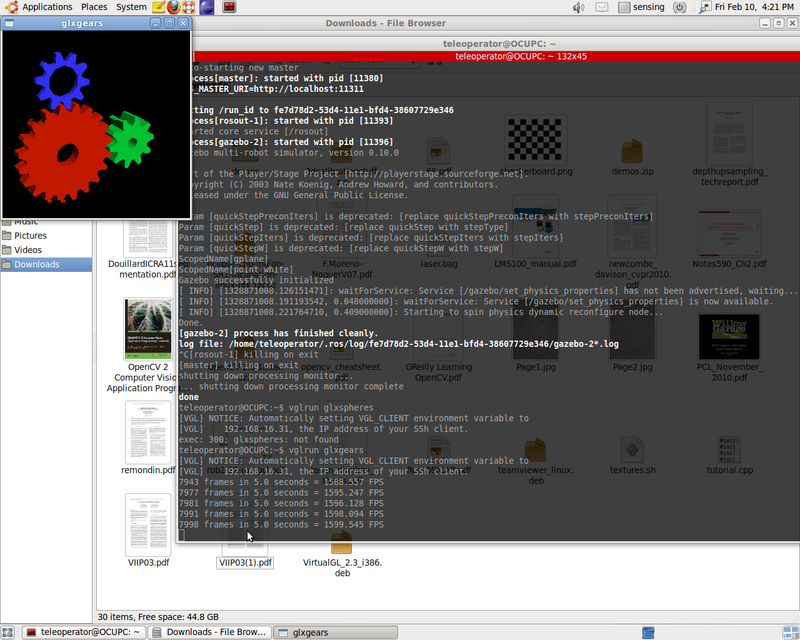 This error occured because xvnc does not handle OpenGL calls to the screen. At this point I suddenly remembered my long tussle with bumblebee on my laptop, and looked up virtualGl, and sure enough, it seemed to be the panacea. So, I downloaded virtualGl binaries from their sourceforge page, and followed the user guide to install virtualGl. So, having installed the virtualGl binaries on both the server(remote machine) and the client(your terminal) and after configuring vglserver_config on the remote machine, relogin to the remote machine using vglconnect [userame]@[ip address], and voila! Everything will be setup by vglconnect. All you need to do then to execute any GL application is to prefix a vglrun to the command, e.g. I use vglrun rosrun rviz rviz. So what goes on behind the scenes is that virtualGl loads a helper library whenever you call vglrun. This nifty little hook sits in the memory, and redirects all GL calls to and from the vglserver, which draws it onto the required buffer. So the application doesn’t even get to know what’s really going on. Neat, huh? As a parting shot, here’s glxgears, running in it’s full ‘glory’.